In 2017, the Office of the Vice Provost Academic (VPA) at York University and the York University Libraries (YUL) received an Academic Innovations Fund (AIF) grant from the Office of the Vice President, Teaching and Learning for the 2017-2018 academic year. This grant funded a unique collaboration between the VPA and YUL to manage different Digital Humanities and Social Sciences (DHSS) projects that could model pedagogy and practice related to experiential and e-learning. In doing so, this project supported the VPA’s portfolio of access and community engagement and the development of the YUL’s Digital Scholarship Centre. 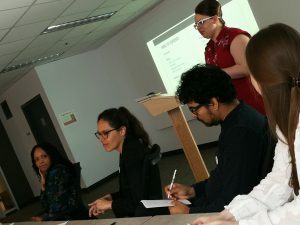 This project also developed as a way to digitize and mobilize York University’s unique archival holdings; specifically the archival holdings associated with the Centre for Research on Latin America and the Caribbean (CERLAC), Centre for Refugee Studies, and the Harriet Tubman Institute for Research on Africa and Its Diasporas, and York Centre for Asian Research (YCAR). The director of each Organized Research Unit (ORU) chose, or worked with the Library to choose, one collection that would be mobilized for this project and one Research Assistant (RA) who would work with this collection during the tenure of the grant. The RA selected 200 items from an ORU-connected collection and created a digital archive, exhibit, and document analysis examples that formed the basis of the Assignment Guides featured in this Guide. This project was lead by Samantha Cutrara, Curriculum Specialist, Office of the Vice Provost Academic, and Anna St. Onge, Director, Digital Scholarship Infrastructure, York University Libraries. Denise is the Coordinator of the Network for the Advancement of Black Communities (NABC). Her passion for community engagement and expertise in digital humanities motivates her to find collaborative and creative ways for agencies across Ontario to share resources, mobilize knowledge, and communicate effectively in lived and virtual spaces. Before joining the NABC, Denise was the coordinator of the Harriet Tubman Institute for Research on Africa and Its Diasporas, York University. She remains the curator of Tubman’s Caribana digital collection. Denise is currently completing her Doctorate in the Faculty of Education at York University. Wendy holds a M.A. in Southeast Asian Studies from the Center for Asian and African Studies at El Colegio de México, in Mexico City. She is currently an international doctoral student in the Department of Geography at York University. Her research analyzes the ways the extraction of river and sea sand in Indonesia (re)shapes the livelihoods of people dependent on agricultural and fishing resources. Wendy is now a student representative for the Canadian Council for Southeast Asian Studies (CCSEAS) and participates as editor of CCSEAS Newsletter. She also teaches courses online as part of the “Prepa en Línea-SEP” program, a national program in Mexico that attempts to provide Mexican students with the opportunity to complete high school. May 10, AIF DHSS Presentation. Our Project by Samantha Cutrara, PhD, for the Office of the Vice Provost Academic, York University is licensed under a Creative Commons Attribution-NonCommercial-NoDerivatives 4.0 International License, except where otherwise noted.